by Richard W. Babin, BS, M.D. The Japanese sword is a thing of beauty, refined over the centuries to be an elegant and efficient weapon when wielded by a trained swordsman. But while the popularity of the Japanese martial arts has increased over the past few decades, there is one area of training that has been sorely neglected the act of actually cutting targets with the sword. 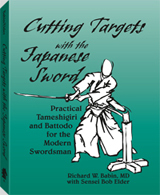 In this unique book, martial artist Richard W. Babin, MD, demonstrates, through detailed description and lavish illustration, the arts of test cutting (tameshigiri) and swordsmanship (battodo). The author of Iaido Sword: Kamimoto-Ha Techniques of Muso Shinden Ryu, with co-author Bob Elder sensei, founder and president of the U.S. Federation of Battodo and the U.S. Federation of Toyama Ryu, covers every aspect of the test-cutting process, including the selection of an appropriate blade, the construction of targets and stands, and the mechanics of cutting, all while emphasizing safety and proper attitude. This invaluable guide also teaches modern swordsmen how to completely rehabilitate a military sword for use in cutting, including straightening, sharpening and polishing the blade and making a new handle and scabbard using common tools and nontraditional techniques. This comprehensive book belongs in the personal library of anyone interested in the Japanese martial arts or swordsmanship in general. 8 1/2 x 11, softcover, photos, illus., 328 pp. Richard W. Babin, MD, is a retired surgeon who served two years active duty in the U.S. Air Force as chief of head and neck surgery at Maxwell Field during the Vietnam conflict. He has practiced muso shinden ryu iaido for 12 years and has been awarded the rank of sandan by the All-U.S. Kendo Federation. Bob Elder sensei has studied the martial arts since 1963, when he was introduced to judo through a book by Trevor Leggett. He later became a student of Isshin ryu karate and then became immersed in the Japanese sword arts.